Looking for the best health insurance plans online? It is essential to buy a health plan that not only provides security for your life, but also creates a ready-to-draw fund for medical emergencies. The following paras will throw light on the top health insurance plans in India and ways of comparing them online. Take a look. There are innumerable health insurance policies available for grabs in the insurance market space. Here is a list of the top 3 health plans that suit the needs of the average Indians. This popular health plan from Religare boasts of an Incurred Claim Ratio of 51% (2016-17). You may opt for this plan if you are an adult of 18 years of age or more. Children above 3 months are also eligible for coverage under this health policy. It offers lifetime renewability with a maximum and minimum sum assured of INR 60 lacs and INR 3 lacs respectively. The benefits provided under the Religare Care plan are covers for hospital rent, pre-hospitalization and post-hospitalization costs for surgery cases, ambulance expenses, as well as a daily cash benefit. The USP of this plan is that there are no limits on ICU-stay charges. Along with one annual free medical check-up, you get recourse to private hospital room facility, air ambulance cover, and personal accident cover among many other add-ons. The high Incurred Claim Ratio (2016-17) of 55% makes this Apollo Munich health plan a coveted option for many. With a minimum entry age of 18 years for adults and 5 years for children, and a maximum eligible age of 65 years, this health plan is certainly worth a look. The maximum and minimum sum assured is INR 50 lacs and INR 3 lacs respectively. 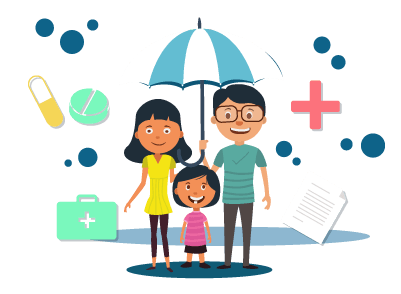 The main benefit of investing in this health insurance plan is that there is a facility of auto-reinstatement of sum assured in case the basic sum assured happens to get exhausted. However, this restoration is possible during the policy period only, and that too once. The policy covers all expenses in relation to life-threatening diseases. It also offers daily cash benefits to the insured. With a minimum entry age of 18 years for adults and 3 years for children, and no maximum age bar, this health plan has an incurred Claim Ratio (2016-17) of 52%. It offers the feature of lifelong renewability. The maximum and minimum sum assured under this plan is INR 1 crore and INR 3 lacs respectively. A maximum of 6 family members are provided coverage under this comprehensive health insurance plan by Max Bupa. The USP of this plan is that it can be purchased at comparatively lower premiums, thereby making it a more cost-effective option for buyers on a budget. It offers higher daily cash benefits too. The sum assured is auto refilled in the event of the basic sum assured getting exhausted. If there are 5 no-claim years consecutively, your basic sum assured increases by flat 100%. While buying health insurance policies, it is essential for you to check what specific insurance providers have in store for you. Do keep the following points in mind while comparing the plans on reliable insurance sites like Coverfox.com. Assess the expenses that are protected under the plan. Certain benefits like OPD expenses, domiciliary expenses, alternate treatment costs like homeopathy and Ayurveda, maternity coverage, etc. may not be covered by certain policies. Along with the scope of coverage, it is equally important to estimate the extent of protection in absolute terms. The list of exclusions varies across health insurance plans in India. Some common exclusions are pre-existing illnesses, congenital defects, cost of cosmetic treatments, etc. You need to pay specific attention to the clauses relevant to pre-existing illness and those occurring in the defined waiting period. The other metrics of comparison include the permissible discounts and rebates on premium, claim settlement policies, hospitals in the network, company history, incurred claim settlement ratio, and so forth. All said, the route to getting an appropriate health insurance plan on insurance comparison sites like Coverfox.com is an easy one. This is provided you take care of the relevant points of comparison according to your requirements. Are you ready to compare and buy the perfect health insurance online? What Type of Solicitor Do You Need?